We are offering Hicks Buddy HB-02 to our clients. Being one of the trusted organizations in the market, we are indulged in providing a wide range of Cotton Ear Bud. 2) Container of 100 and 200 sticks. 1= Carton contains 600pcs each. Farlin Spiral Cotton Buds are anti-bacterial which made of active carbon (Charcoal), so you can safely use them on your little angel's body. In order to cater the variegated demands of our precious clients, we are offering an excellent quality range of Applicator Bud. 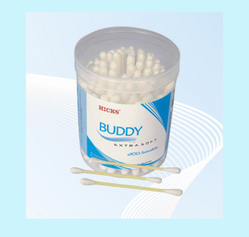 Cotton buds are made from only 100% pure cotton that is naturally absorbent and gentle. - 400 swabs / 200 sticks in a Plastic Jar. - 100% Pure Cotton & Strong sticks, made of virgin plastic.